When working in some situations large corded or 18V reciprocating saws sometimes are just too bulky to fit in tight places while a jigsaw would be too small and underpowered. For example, when you have to reach up inside a joist space and there is not enough room to move with most power saws (and definitely not enough room to get any productive strokes out of a hand saw) the Porter Cable PCL120CRC-2 12V Lithium Cordless Pivoting Reciprocating (Clamp) Saw Kit gives you complete functionality and precision control. It also shows how a reciprocating saw can be compact yet powerful all at the same time – and still pack in some cool features. Some of our favorite features include the 0-90 degree pivoting handle, adjustable clamping shoe and a 1/4 turn quick change blade release. The Porter Cable PCL120CRC-2 12V Lithium Cordless Pivoting Reciprocating Saw Kit arrived in a cardboard box with everything individually packaged inside. The kit includes the 12V reciprocating saw, two lithium-ion batteries, 30 minute quick charger, two 4″ saw blades (one for cutting wood and one for metal), storage bag and the owner’s manual. The body is made of gray Glass-Filled Nylon (GFN) and has a comfortable amount of black rubber overmold on it. The pivoting handle on this saw makes it able to tackle a wide variety of jobs since it has the ability to angle from 0 to 90 degrees. To pivot the handle there is a sliding switch that, when engaged, allows the handle to be locked in place at 0, 45 or 90 degrees. The saw has a built in LED work light that turns on when the trigger is slightly depressed, making work in low-light attics and crawlspaces even easier. What really sets this saw apart from the competition is the adjustable clamping shoe that adjusts for cutting up to 2” pipe. To extend or close the shoe, you simply loosen the Allen head screw that locks it into place. A hex key for adjusting the clamping shoe is included and is securely stored when not in use on the right side of the saw. For a feature like this, where you might want to engage it more frequently, it would have been nice to see a tool-less adjustable solution. Blade changes are a breeze, however, you just give the blade clamp a 1/4 turn and you are good to go. Given that standard reciprocating saw blades fit into the quick release blade clamp, you have the ability to cut almost any material that you can get a blade for. Given that the saw only has 5/8-inch of stroke, we suspect that most folks would use this saw for smaller cutting projects and leave heavy-duty demo to the big boy sized saws. While the 30 minute quick charger has indicator lights on it to show the status of charging batteries and we are bummed that no battery level indicators are built into the tool or the batteries. The zippered storage bag holds everything in the kit very well with some space to spare for other tools and accessories. To try out the cutting abilities of the Porter Cable PCL120CRC-2 12V Lithium Cordless Pivoting Reciprocating Saw we used it in a number of different applications. 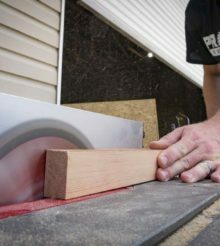 In one of the tests we used the included 4″ wood blade to cut through a piece of 2×4 lumber. We chose a 2×4 because it takes more energy and power to clear the blade of chips that are being cut as compared to cutting a piece of 1x that most saws (including this saw) can cut very easily. We secured a board in a vice and then started cutting and we noticed that the included wood blade was having a hard time cutting without the blade getting clogged up. We swapped out the wood blade with a 6” DeWalt bi-metal wood blade. With this blade the saw was able to make several cuts through the 2×4 without any trouble. difficult, but that is not the case with this saw because the clamping shoe keeps the saw straight. It also minimizes the vibration transferred to smaller workpieces which allows for greater cutting control. One of the features that we really liked was the 0-45-90 degree pivoting handle because with it set at 90 degrees it fit and could be used in small spaces. Also in this configuration, the saw could double as a jigsaw with the right blade in place. Even though this saw is not a full size reciprocating saw replacement, it definitely has its place in many lines of work since it is able to accomplish a wide variety of tasks. The Porter Cable PCL12OCRC-2 12V Lithium Cordless Pivoting Reciprocating Saw Kit demonstrates plenty of power and versatility for many situations. For heavy-duty applications like demolition, we suggest that you stick with its larger 18V or corded brothers. All in all, the saw proved to be lightweight, ergonomic and compact, and provided very good control when used on smaller workpieces. For our Performance rating, we gave this tool a 7/10 because it is a great performer in light to medium duty tasks. For are value rating, we give this kit a 6/10 because you get a great performing saw that is packed with features.